While you were in high school, the organizational structure was very clear cut. Your teachers were in charge of the classroom, and if an issue was elevated beyond the classroom, the principal or assistant principal became involved. However, a hierarchy beyond your school’s principal did exist and in many cases that hierarchy served to determine the policies and procedures followed at your school. Understanding the organizational structure of a university can help students understand the complexity of a campus community and how to better navigate in that environment. Universities across the United States offer slightly different hierarchical structures. 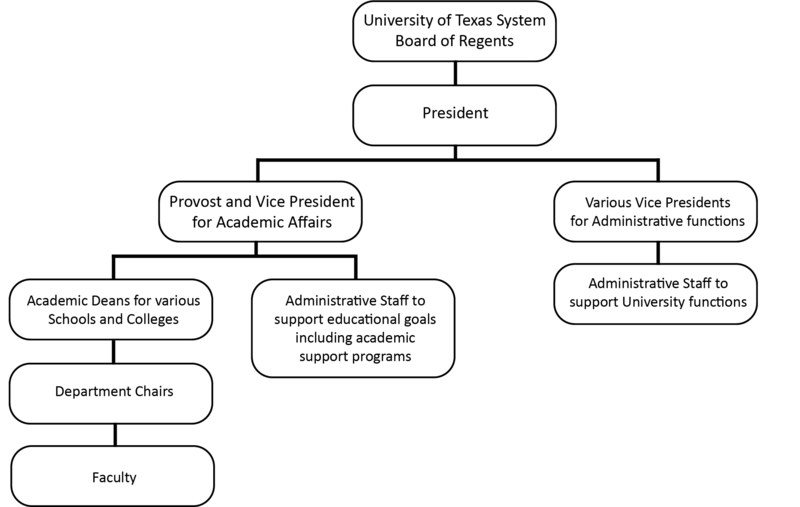 The organizational chart and nomenclature depicted in Figure 2-1 represents the general structure of UT Arlington. The president of a university provides the overall leadership of the institution’s academic and administrative units as well as serves as a liaison to the State government and the UT System Board of Regents, the primary governing board for UT Arlington. The president is typically very involved with fundraising for the university and promoting the positive image of the institution (Pusser & Loss, 2009). The provost is the “chief academic officer” of the institution and serves to develop and implement the educational goals of the institution (Bray, 2009). An academic dean serves as the leader for all of the academic departments within a particular school or college and reports directly to the provost. Deans lead the department chairs and their faculty in developing and implementing the curriculum and academic requirements necessary for students to earn a degree from the university (Del Favero, 2009). In addition to serving as a role model for teaching and conducting research, deans also manage the administrative issues allocating resources and funding for their school or college. Department chairs for each academic department serve as the liaison between the dean of the college and their faculty. Their primary tasks include faculty development, management of the department resources, conducting research, and teaching (Wolverton, 2009). The faculty members are what students typically think of as their “teachers,” though are typically referred to as “professors” in higher education. Faculty members have typically earned a higher-level degree in the specific discipline in which they teach and conduct research to further the knowledge of their academic discipline. Ultimately, the faculty members from an academic department determine what knowledge students should master in order to obtain a bachelor’s degree from that academic discipline. Typically, this knowledge base is reflected in the courses offered by a given department and the degree requirements set forth in a degree plan for a particular major (Pusser & Loss, 2009). It is also important to note that beyond the classroom there are experienced professional staff on campus that help students succeed and ensure that a university of this size can function every day. Staff members that you may see regularly include student affairs professionals who ensure a positive campus life and student leadership opportunities, academic advisors who help students navigate the curriculum of their degree plans and understand the policies and procedures needed to obtain that degree, and counselors who help students deal with stress or personal issues that are impeding academic success. However, there are staff that you may only see intermittently or not at all, such as the financial aid counselors that students may visit only when there is an issue with funding and the people on campus that pay employees of the campus, facilities workers who maintain the beautiful landscape, or chefs who cook the food served in the cafes. UT Arlington is a bustling, vibrant community with dedicated faculty and staff here to help students succeed however they can. How are the American History classes offered in high school different from the American History classes in college? Previous: 2.1 What Does a University Do?